2001 Firebird, nick named the copper cannon by the crew at Phoenix. 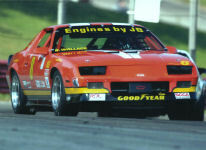 Car built by Phoenix Performance in 2001 and raced by Don Knowles. We acquired the car in 2014 as a backup car and used very little since. Fresh, zero time LS1, refreshed by F-Body performance in MD. Copper color, matching paint on interior and cage. Penske adjustable shocks. These cars just got the GM performance cam last week so will be very competitive. Retiring from racing and have too many cars. Contact Ted at 717-515-8242, please leave a message with your contact info. Last edited by Ted Warning; 01-24-2019 at 01:04 PM.